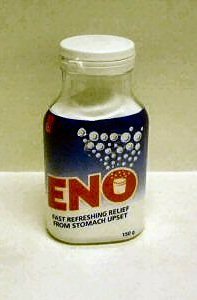 Kurma replied: “In a nutshell, ENO is a “fruit salt”. For those of you who do not know what a fruit salt is, it is a mix of Sodium Bicarbonate (46.4%), Citric Acid (43.6%), Sodium Carbonate (10%). GlaxoSmithKline makes this product. Its effervescence-causing components (especially in the presence of the acidic yogurt) allows the batter of the dhokla to aerate. These air bubbles are fixed in the steaming process (in a similar way that the aeration from yeast works in baked bread) thus creating the lovely spongy texture of the Dhokla.